BOOK SALE BLOWOUT & FRIENDS MEMBERSHIP DISCOUNT— FEB. 25-MAR. 2!! We are clearing out books at great prices! Children, Teen, and Adult Books. The sale will run in the main library’s annex during library hours (Mon-Thurs: 9am-9pm; Fri: 9am-7pm; Sat: 9am-5pm). 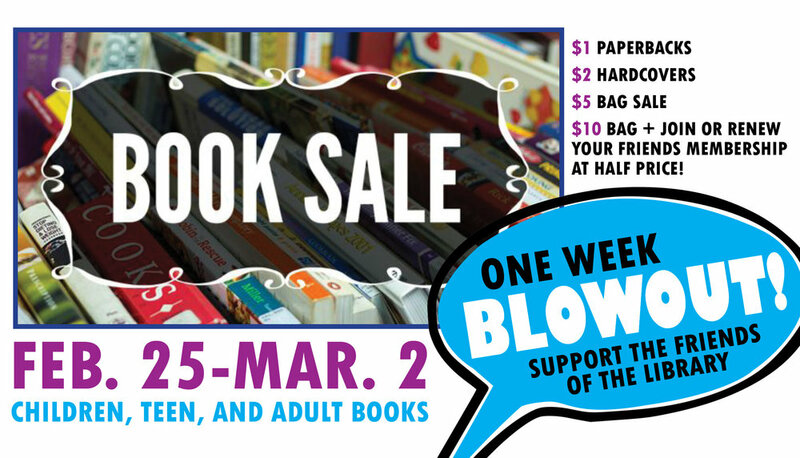 Look for a book sale at our Morristown Branch soon! We are excited to announce that a Friends of the Library Used Bookstore is now open inside the library's annex, the Carnegie East Wing! The store includes books, movies and music that have been donated by the community and material that has been weeded out from the library's shelves. There is also a small coffee bar. It is open during library hours. Hardcovers are $2 / Paperbacks are $1 / Antiquities are priced individually. Money raised through sales goes directly to the Friends of the Library. We appreciate book donations! Here is our policy. If you are interested in volunteering at the store, please contact us.